Note the reddish, yellow lesions on these young, misshapen fruit. Photo by Jay W. Pscheidt, 1993. Close up of orangish cup-shaped pustules (aecia) on Pyrus calleryana (Bradford pear). 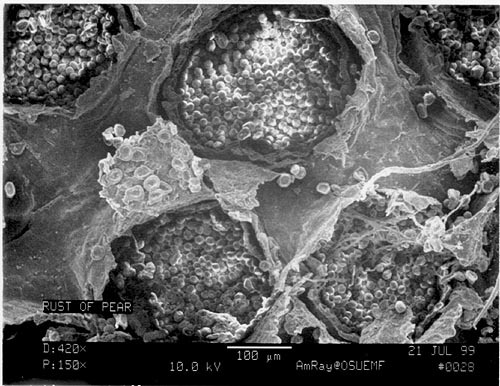 This is a scanning electron micrograph of aecia and aeciaspores (150x). Photo by Al Soeldner, 1999. 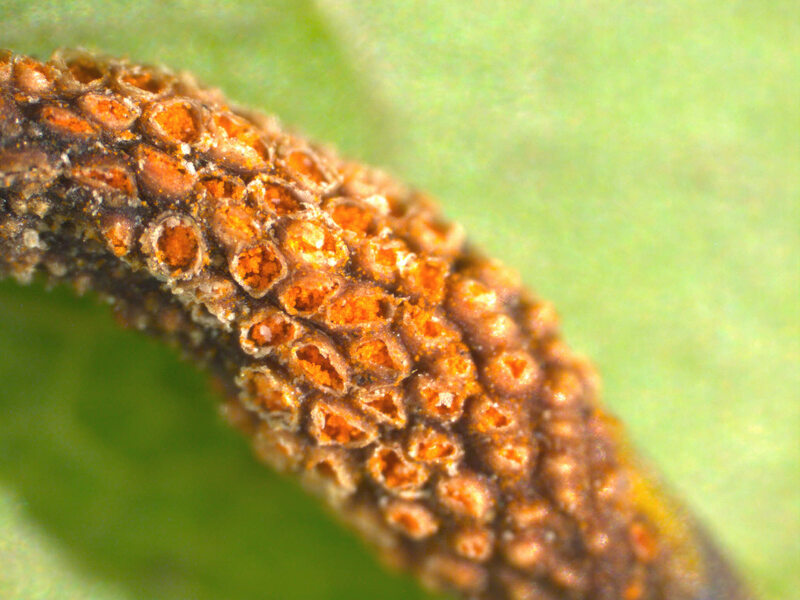 Pear rust can also occur on the flower petals as well as leaves and fruit. Numerous rust pustules (uredia) can be seen on these flowering pear leaves (Pyrus calleryana). Cause Gymnosporangium libocedri, a fungus. The rust fungi in this genus alternate between a conifer and roseacous host. Similar spore stages on pear are produced on apple, crabapple, hawthorn, mountain ash, quince and serviceberry (Amelanchier). The alternate host is the incense cedar (Calocedrus decurrens). 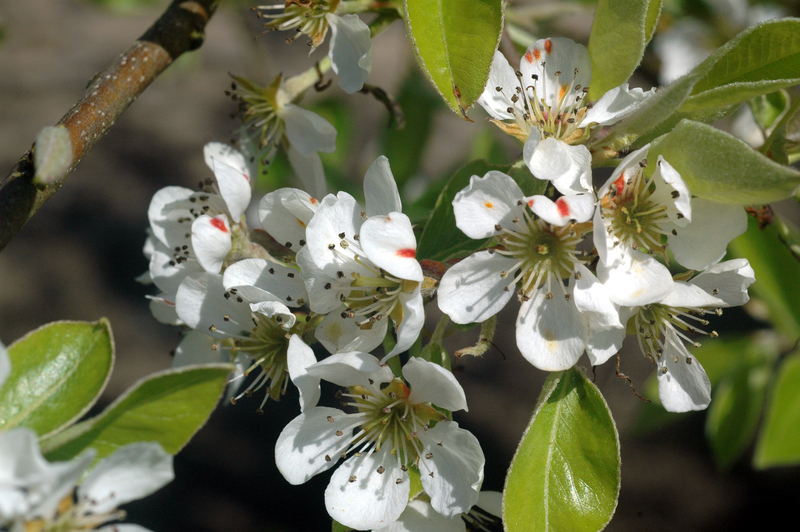 The disease has been reported commonly from the Willamette Valley of Oregon, but outbreaks are economically significant to orchardists only every few years. Oriental and European cultivars are susceptible. (Note that G. asiaticum occurs on Asian pears.) 'Winter Nelis' is severely affected while under the same conditions 'Bartlett' is less affected. Some years 'Bartlett' can be severely affected but other pears show even greater symptoms under the same conditions. Symptoms Pear fruit are malformed while young and drop from the tree. Bright-yellowish to orangish spots with numerous cup-shape pustules (aecia) develop over the fruit surface. Spots fade and darken as the fruit matures or falls off the tree. Green shoots and leaves also are attacked but not as frequently. Symptoms are most obvious after flowering but before July. The disease on Incense cedar is called broom rust because it causes a witches' broom. Telia develop only on the leaves and are not very noticeable until during spring rains when they look like orange jelly. Trees with many infections decline and may die. Cultural control Remove alternate hosts around the orchard. Chemical control The following do not specifically list this pear rust but can be used to control the disease. Apply during the time cedar trees have swollen, orange telia in early spring. In western Oregon this is usually during bloom. Aprovia at 5.5 to 7 fl oz/A plus an adjuvant. Do not use within 30 days of harvest. Group 7 fungicide. 12-hr reentry. Flint 50 WG at 2 to 2.5 oz/A. Do not use within 14 days of harvest. 'Concord' grapes may be injured if accidentally sprayed. Group 11 fungicide. 12-hr reentry. Fontelis at 16 to 20 fl oz/A. Do not use within 28 days of harvest. Group 7 fungicide. 12-hr reentry. Inspire Super at 12 fl oz/A. Do not apply within 14 days of harvest. Group 3 + 9 fungicide. 12-hr reentry. Ph-D WDG at 6.2 oz/A is regestered for a different species of rust. May be applied on the day of harvest. Group 19 fungicide. 4-hr reentry. Procure 480 SC at 8 to 16 fl oz/A. Do not apply within 14 days of harvest. Group 3 fungicide. 12-hr reentry. Tebucon 45 DF at 4 to 8 oz/A. It is unknown if there is a PGR effect on shape when using this product during bloom. Do not use within 75 days of harvest. Group 3 fungicides. 5-day reentry. Topguard at 8 to 12 fl oz/A. Do not use within 14 days of harvest. Group 3 fungicide. 12-hr reentry. Trionic 4 SC at 8 to 16 fl oz/A. Do not apply within 14 days of harvest. Group 3 fungicide. 12-hr reentry. Notes Some registered products offer only suppression of this disease and thus are not recommended for use. These products include Merivon, Pristine, and Sovran. Insignia SC at 6 to 12 fl oz/100 gal water. Do not use with organosilicate-based adjuvants. Group 11 fungicide. 12-hr reentry. References Pscheidt, J.W., and J.P. Bassinette. 2007. 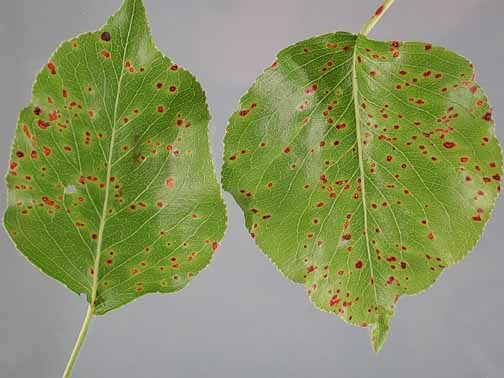 Comparison of fungicides for control of rust on Serviceberry, 2006. PDMR 1:PF042. Wilson, E.E. and Ogawa., J.M. 1979. 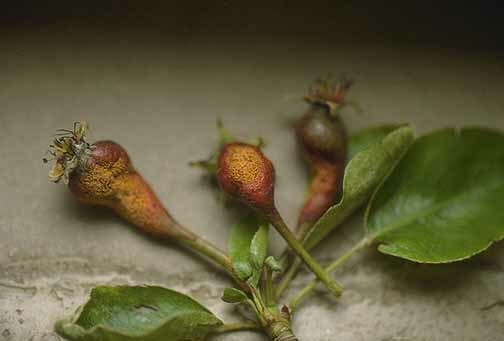 Fungal, Bacterial, and Certain Nonparasitic Diseases of Fruit and Nut Crops in California. Berkeley, CA: University of California, Division of Agricultural Sciences, Agricultural Sciences Publications.